The fee for the marriage license is $82.00 cash or credit card. Proof of identity - may include an official copy of the applicant's birth certificate, a driver's license or state-issued identification card, or an approved document issued by Texas or another state, the United States, or a foreign government (i.e., passport, visa, military identification, etc.). Provide Social Security Number of each applicant (if the applicant has one). Applicants do not need to show a Social Security Card. If divorced, and the divorce was finalized in Texas within the previous 30 days, an applicant must provide a certified copy of the divorce decree which states that the 30-day waiting period has been waived. This does not apply to out-of-state divorcees. If a previously-divorced applicant wishes to use her maiden name, she will need to provide identification showing that maiden name (such as a certified copy of her birth certificate or a certified copy of her divorce decree that states her name is to be changed). Order birth certificates, death certificates, and birth, death, marriage, and divorce verification letters through Texas.gov, the official site for the State of Texas, for fast, affordable service. If an applicant is unable to appear personally before the county clerk to apply for a marriage license, any adult person or the other applicant may apply on behalf of the absent applicant. Please see the Absent Applicant Instructions and Form below for more information. If the absent applicant will be unable to attend the ceremony and he/she must appoint one adult, other than the other applicant, to act as proxy for the purpose of participating in the ceremony. There can only be one proxy listed and cannot be changed once the affidavit is notarized. The proxy is not required to appear at the time the marriage license is issued. 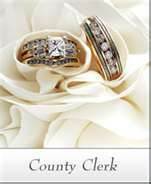 Effective September 1, 2013 the Walker County Clerk's Office will only accept Proxy Marriage for Active Members of our United States Military. This was passed with HB869 on April 11, 2013. Must be at least 18 to get license unless you have a Court Order. EXEMPTION FROM FEES FOR DEPLOYED MILITARY PERSONNEL. A member of the National Guard on federal active duty, or a member of the armed forces of the United States on active duty, who is preparing to be deployed to serve in a hostile fire zone as designated by the United States secretary of defense is exempt from paying the following state or local governmental fees the member incurs because of the deployment to arrange the member's personal affairs. Copies of the following: Birth certificate; a recorded marriage license; a divorce decree; a child support order; guardianship documents; and property tax records. Following the ceremony, the person authorized to conduct the service must date, sign, and note the county where the ceremony occurred on the certificate. The marriage license must then be returned to the Walker County Clerk's Office within 30 days from the ceremony date. Once the office receives the license, it will be copied and filed and the original will be returned to you.